What is it about this place…? I don’t know about you, but I receive dozens of images on my Facebook feed, every single day. Mostly I flick through them without really looking, perhaps hit the Like button here and there…but it takes something pretty special to make me stop and linger. Last week, an image of Wineglass Bay, on Tasmania’s east coast, appeared in my feed (above). It was an aerial shot of that familiar crescent of sand, curling around glittering blue-green ocean and framed by forested mountains. I know that beach. I’ve walked it many times, slept in a tent there, swum in that glassy ocean. Vivid memories came to me as I studied the image. It was one of those ‘stop and linger’ moments. 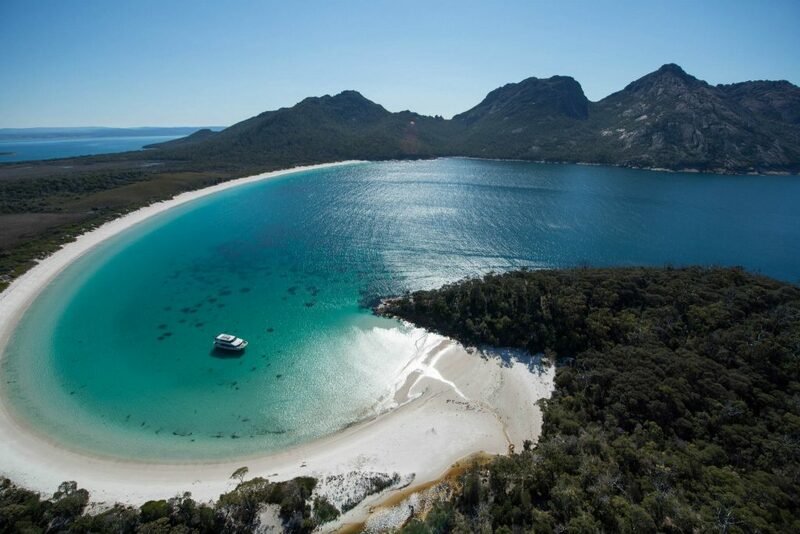 Wineglass Bay Cruises (Tourism Tas, Brendan Williams). Within a couple of days, this picture had received thousands of likes and shares. By day two it had reached over 150,000 people, and attracted a seemingly endless string of glowing comments that rolled out beneath the image. There was a passion in those comments that really made me think about Wineglass Bay and why it has such an impact on people. That single image of that single beach seems to have stirred all kinds of feelings and memories. That one really touched me—that the sight of a little beach in a photograph still has the power to bring back a treasured memory that is almost four decades old. There is something about Wineglass Bay that is so alluring, that it remains imprinted in the memory long after the experience itself has passed. I have my own memories of Wineglass—that I’m lucky enough to renew on a pretty regular basis. When I first walked here, I was backpacking around the state, having adventures. I remember seeing it for the first time from the lookout, and the feeling of anticipation as I walked down to the bay in the summer heat, and the extraordinary feeling of emerging from the forest onto that white sand. And I will never forget the feeling of stepping into that turquoise ocean for the first time. It was so beautiful that I stayed two days and nights, swimming, wandering, but mostly sitting and looking. Without exception, each time I’m here, it’s a wrench to leave. I want to linger on that beach, sit and watch the conversation of sky and sea over the course of a whole day, watch the sky deepen to night and blaze with unobstructed stars. The first night I slept here I lay on my back under that sky and watched shooting stars flash across the sky, streaks of white gleaming across the biggest, brightest Milky Way I’d ever seen. Hard to believe really, that I was just under two hour’s walk from my car. I think this is part of the magic of Wineglass Bay. It feels like another world, but it is so close, so simple to find. It really doesn’t matter how old you are, what stage of life you’re in or how mobile you are, you can get to Wineglass and have that same experience of being surrounded by wild, unspoiled beauty, within an hour of two of leaving your car. This is one of those rare places that you really do have to make sure you visit. Wineglass Bay touches people. 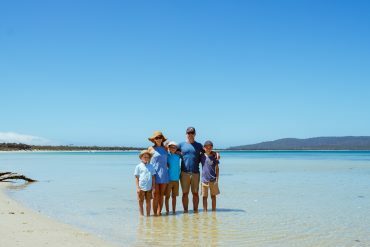 The thousands of likes and shares that Facebook post generated represent just a small percentage of people who have been affected by the experience of visiting Wineglass Bay. And the thing is, that the reality actually does match the imagery. And it’s so ridiculously easy to experience. 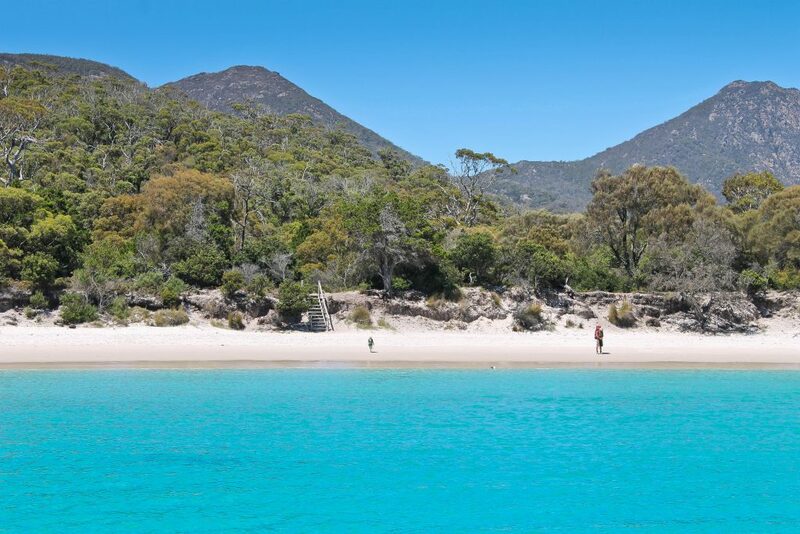 There are three broad options for visiting Wineglass Bay. 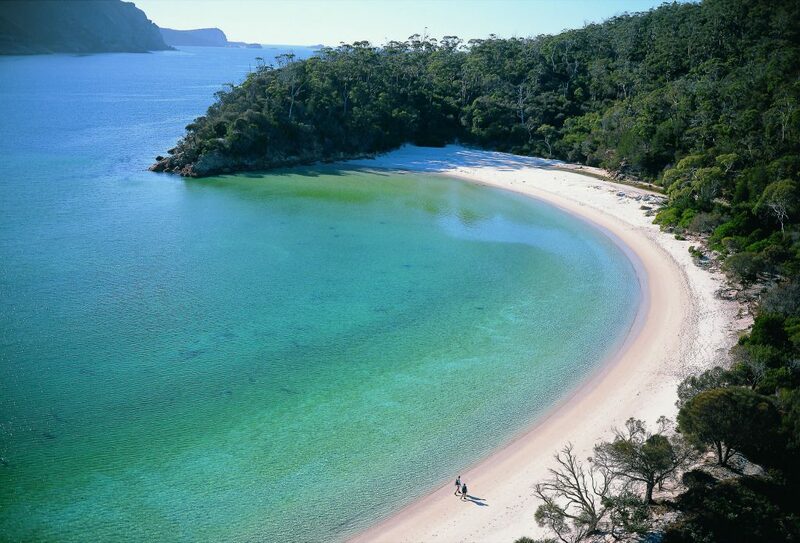 The walk to Wineglass Bay beach from the National Park carpark takes around two hours return, depending on your pace. The first section of track, which leads to the lookout, is a fairly steep 1.3 km climb, but it does reward you with that view. From the lookout, the walk leads you on a downhill bush track through eucalypt forest to the bay itself. You’ll need a reasonable level of fitness, walking shoes or boots, clothing to suit the weather and adequate drinking water and snacks. Make sure you check the Tasmanian Parks and Wildlife Service website for information about the walk before you set off. If walking is not for you, there are a range of options for arriving at Wineglass Bay by sea—including half day, full day or overnight eco-cruises, yacht charters and multi-day walking and sailing itineraries, departing from Coles Bay or Hobart. Please note that Wineglass Bay Cruises offer a sightseeing eco cruise, while Sail Freycinet and Wineglass Bay Sail Walk give you a range of walking and cruising options. 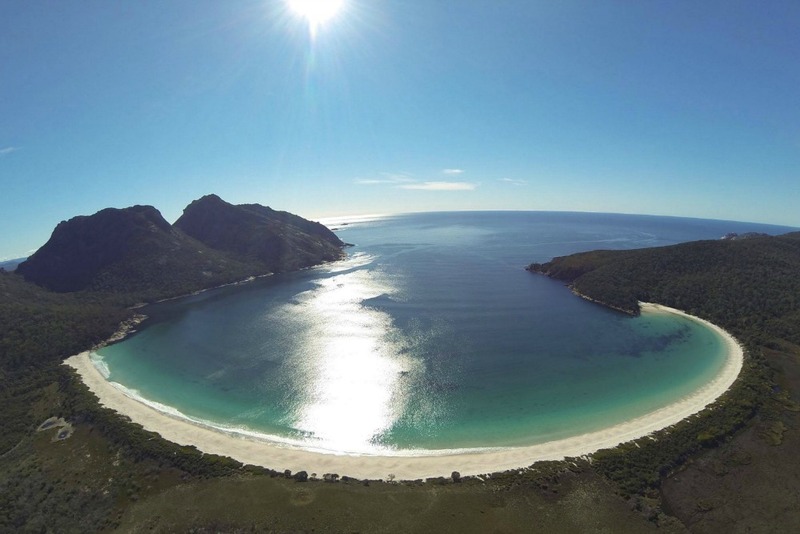 You might also like to take your own unforgettable aerial shots of Wineglass Bay and the Freycinet Peninsula. A range of scenic flights and helicopter tours will take you over the over the Peninsula and other parts of the east coast—giving you the view, and the experience, of a lifetime. Please note, Freycinet Air charter flights over Tasmania’s East Coast from Friendly Beaches, while Par Avion departs from Hobart. Freycinet Aqua Taxi runs water transportation services to Wineglass Bay in Freycinet National Park, departing from Coles Bay. Scheduled sailings depart daily and are a popular way to experience Freycinet’s walking tracks. Whether you’re after a short walk, a long hike, or simply to spend the day on a secluded beach. 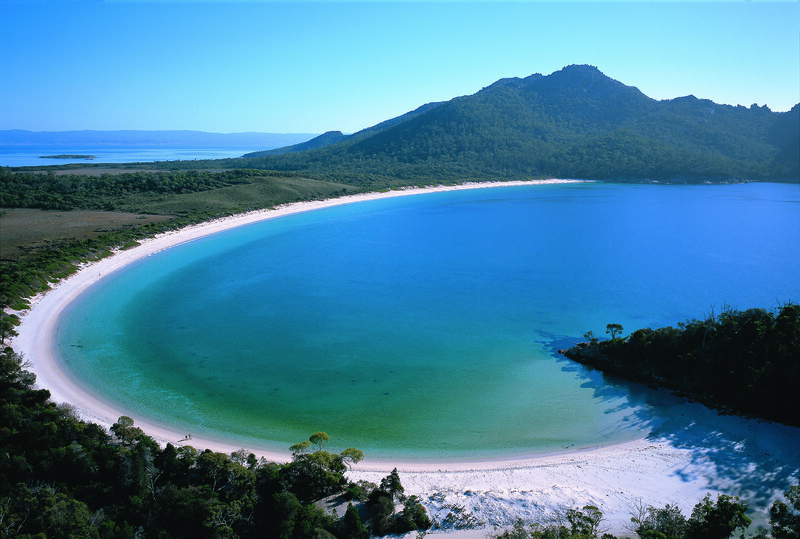 For more information, see our page on Coles Bay and Freycinet National Park. If you want to find out for yourself how it feels to wake up at Wineglass Bay, and are happy to camp, there is a small campsite at the end of the beach. 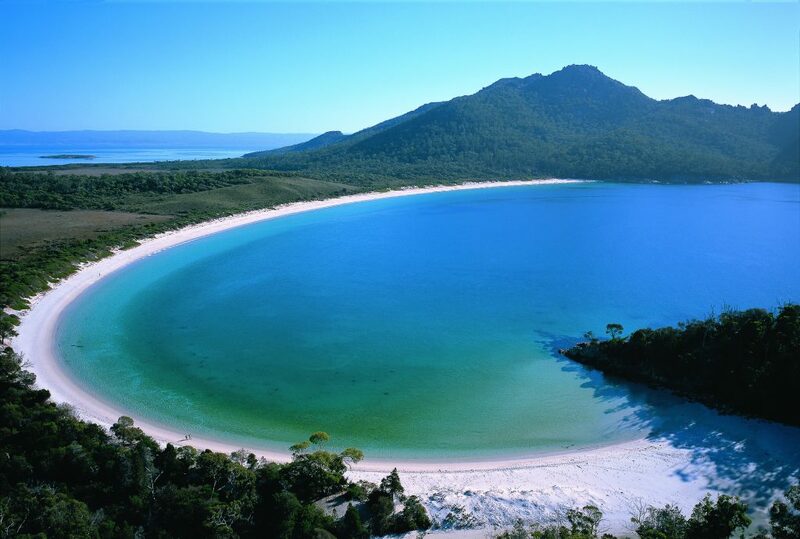 Campsites are also located within Freycinet National Park at the beautiful Hazards, Cooks and Bryans Beaches. 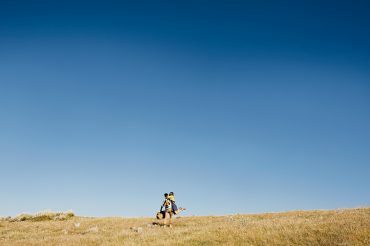 As with walking, it’s important to make sure you’re properly equipped and have adequate food and water if you’re planning to camp. For camping information, check out the Wildlife Service website. If camping is not your style, you’ll find a range of accommodation in and around Coles Bay, from eco-lodges to holiday houses and B&Bs with fabulous east coast views. Check our page here to find out more about all your accommodation options. I understand why that one image of Wineglass Bay had such an impact on people, because that place has worked its magic on me as well. But that is just one beach on the east coast of Tasmania. 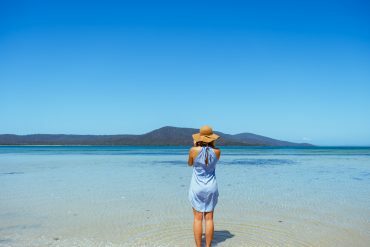 This is a place where some of the most incredible coastal locations in Australia can be found—like the incredible Bay of Fires and Maria Island National Park, which both offer coastal experiences that are literally unlike anything else you’ll find in this country. 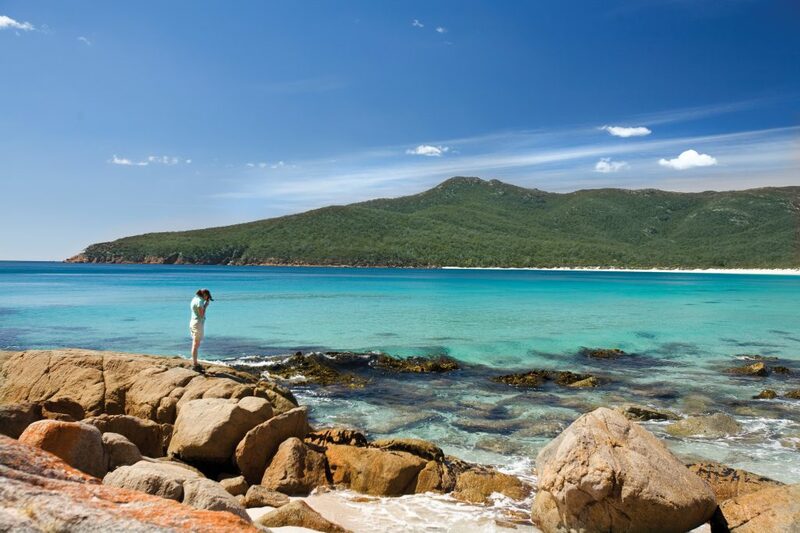 But all along the 220 kilometres of coastline that make up Tasmania’s east coast, you’ll find beaches and secret places that will work their way into your heart, just as Wineglass Bay does. In the coming weeks, we’ll be sharing some of those places with you and introducing you to the coastal magic of Tasmania’s east coast, from it’s familiar, photogenic destinations, to its hidden gems and best kept secrets. I hope you’ll join us. I promise, you won’t regret it. Amazing pictures will be paying a visit for sure when I am their in February.